Is there an easy way to remember VSEPR shapes? I think you will have to do some memorizing, but most of the shapes you can figure out. The basic shapes depend on the steric number (#SN#) of the central atom. Here are the 5 basic shapes. They are also called the electron geometries. Memorize them. 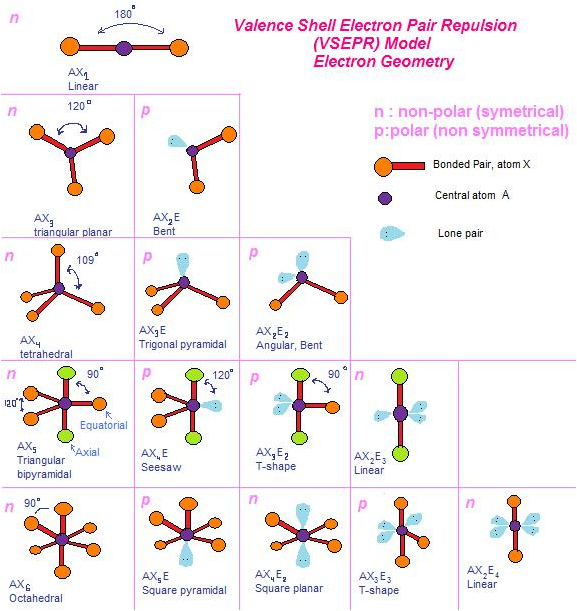 These occur when you have both atoms and lone pairs on the central atom. These are often called the molecular shapes. You can usually figure them out by putting the lone pairs as far from the other electrons as possible. The number of possible shapes is #SN-1#. The shapes are summarized in the chart below. Here's an interesting video that may also help. How do electrons fill orbitals? What are some common mistakes students make with orbitals? What are orbital probability patterns? What is an example of a orbital probability patterns practice problem? How does an atomic orbital differ from a Bohr orbit? Why are orbitals described as probability maps? Why do orbitals have different shapes? What are the number of sub-levels and electrons for the first four principal quantum numbers?